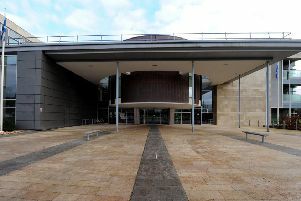 Footballer Danny Swanson has appeared in court accused of attacking a staff member at an Edinburgh pub. Swanson, 32, is alleged to have punched employee Christie Harte to the face during a bust up inside the Finnegan’s Wake bar. The St Johnstone midfielder, who has also played for Hibs and Hearts, is also said to have behaved in an aggressive manner and shouted and swore during the alleged violent exchange. Swanson is also alleged to have refused to leave the city centre boozer when asked to do so by pub staff before going on to threaten them with violence and struggle with them last month. Swanson, from Leith, appeared in the dock at Edinburgh Sheriff Court last Friday where he lodged not guilty pleas to the two offences. The midfielder will return to court to stand trial in July this year. Swanson is alleged to have behaved in a threatening or abusive manner by shouting, swearing, refusing to leave the premises, threaten staff with violence and struggle with them at Finnegan’s Wake pub on Victoria Street, Edinburgh, on March 1 this year. He is also said to have punched Mr Harte to the face causing injury during the same incident. Swanson appeared for the Saints as a second half substitute in a 2-1 home defeat to Hibernian just two days before the alleged offence took place.